You can create the artwork for the different states of your Flash buttons in Adobe Flash Creative Suite 5 Catalyst, or in Photoshop or Illustrator. Catalyst has several filters that you can use to easily add drop shadows or glows to objects. You can use these filters for the different states, or you might want to change the size or color of the button. 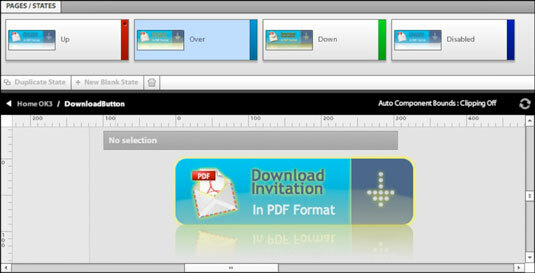 Select the button and choose Modify→Edit Component. You are now in Component Editing mode. The four states of the button appear in the Pages/States panel. Click any state in the Pages/States panel that you want to edit. Edit the button in the Artboard. Exit Component Editing mode by choosing Modify→Exit Editing. The four states of the button (Up, Over, Down, and Disabled) appear in the Pages/States panel. In the Pages/States panel, click the State that you want to edit. Click the button again to select it. In the Properties panel, expand the Filters pane (if it’s not already open). Click the Add Filter button and choose a filter. Filter controls appear in the pane. You might need to scroll down to see them all. 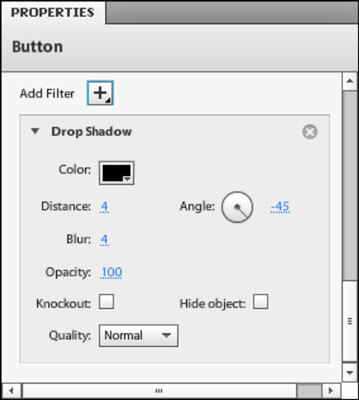 Adjust the look of the filter, using the filter controls that appear in the pane. Each filter is different. For example, the Inner Glow filter lets you specify a color, blur, opacity, strength, knockout (hides the fill), and quality. Test your new button state by clicking the Play button at the top of the Timelines panel, or by choosing File→Run Project. If you choose File→Run Project, your web site opens in your default browser. Check out your new button state with the filter. Exit the Component Editing mode by choosing Modify→Exit Editing or clicking your project name in the Breadcrumbs section above the Artboard.